Professor Marzena Dominiak, chairwoman of the Scientific Committee of the Congress, President of the Polish Dental Society and a member of the FDI Educational Committee. On behalf of myself and all members of the Scientific Council I cordially invite you to join us at the 3rd Polish Dentistry Union Congress, which will be held in tandem with the 28th Central European Dental Exhibition CEDE on 19-21 September 2019. All those who strive constantly to extend their knowledge and improve their skills in line with current global standards are warmly welcome in Poznan. The Polish Dentistry Union Congress can achieve its mission in this spirit thanks both to the involvement of outstanding experts – practitioners, and academics, many of whom are heads of specialist societies and associations, and its collaboration with the FDI World Dental Federation and its European counterpart ERO-FDI. 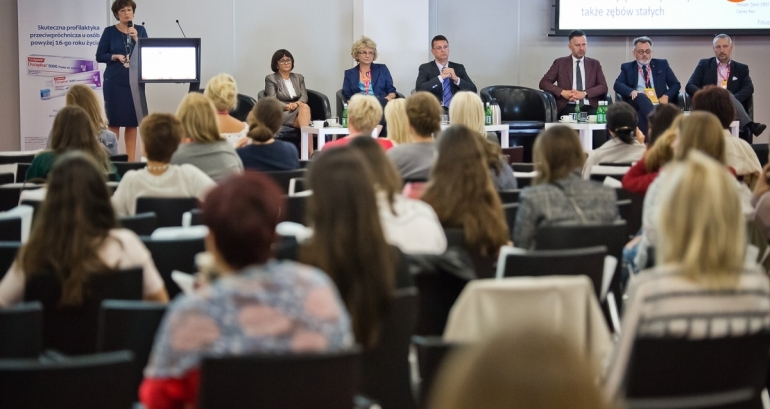 No other educational event in Poland can boast such a broad programme and such high standards as well as so many participants. Indeed, no other event in the country involves contributions from so many organisations committed to so many unique projects – all based on the “dentistry union” formula - under the auspices of the Polish Dental Association, which I have the honour and pleasure to represent These organisations include: The Polish Paediatric Dentistry Association, the Polish Endodontics Association, the Polish Society of Implantology and Be Active Dentist. The first two editions helped us provide the Congress with the right profile. The event is undoubtedly most effective in addressing the needs of general practice dentists who everyday deal equally with child patients just as much as they do conservative dentistry and prosthetics. It is with these professionals in mind that we organised panels devoted to, among other things, rational antibiotic therapy, treatment for pregnant women and treatment protocols for milk teeth. The high attendance at our earlier congresses not only gave us real momentum, but also showed that we were clearly capable of putting together an attractive educational programme for general dentists. We invite all dentists, regardless of their years of practice, the number of dental chairs they have or the size of their dental office. The Congress’s statistics show that thanks to PDUC the latest knowledge and advances in our profession are reaching even the remotest parts of our country. Come to Poznań. Bring your hygienists and dental assistants with you. Make sure your technicians know about us. Together we can make this a true celebration of Polish dentistry. If you don’t move forward you stand still – that’s why we are already beginning preparations for next year’s Congress. In response to numerous inquiries, proposals and analyses of participants' surveys, the programme for the 3rd Congress of the Union of Polish Dentistry will focus on three issues: modern technology in dentistry (trends), teamwork (interdisciplinary as well as dentist + assistant + hygienist + technician) and complications (including those occurring as a result of a wrong diagnosis). There will certainly be no shortage of interesting discussion panels, lectures and workshops. Using the same formula as last year we plan to organise educational fora open to all CEDE guests. These will be located in the MTP pavilions right next to the exhibitors’ stands We will also continue our search for new leaders of Polish Dentistry via our Science Head Rush session. We will provide more details on the Congress programme in the early Spring. Follow us via our information channels: www.cede.pl, www.cedenews.pl as well as on CEDE and PTS social media.